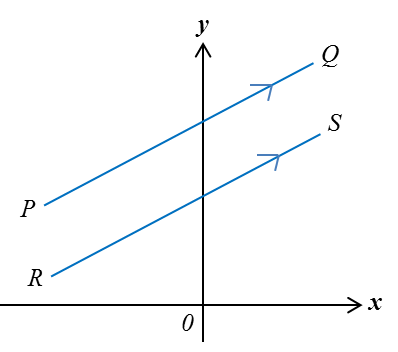 Determine whether the two straight lines are parallel. 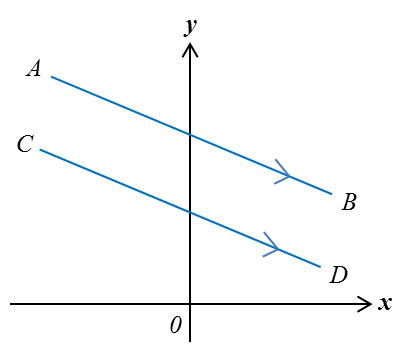 Therefore, the two straight lines are parallel. 2y=3x−4 y= 3 2 x−2, m 1 = 3 2 3y=2x+12 y= 2 3 x+4, m 2 = 2 3 m 1 ≠ m 2 ∴ The two straight lines are not parallel. Step 1 : Let the equation of the straight line take the form y = mx + c.
Step 2 : Find the gradient of the straight line from the equation of the straight line parallel to it. Step 3 : Substitute the value of gradient, m, the x-coordinate and y-coordinate of the given point into y = mx + c to find the value of the y-intercept, c.
Step 4 : Write down the equation of the straight line in the form y = mx + c.
Find the equation of the straight line that passes through the point (–8, 2) and is parallel to the straight line 4y + 3x = 12. 4y+3x=12 4y=−3x+12 y=− 3 4 x+3 ∴m=− 3 4 At (−8,2), substitute m=− 3 4 , x=−8, y=2 into: y=mx+c 2=− 3 4 ( −8 )+c c=2−6 c=−4 ∴ The equation of the staright line is y=− 3 4 x−4.